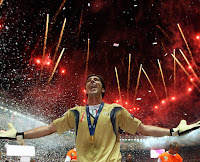 Juventus’ Gianluigi Buffon will renew its contract with the club for further three years in Turin on Wednesday, January 23, 2013. The Italian goalkeeper has been with the club since 2001 and there were speculations that he might leave the club. The amount of the deal is not disclosed yet but it could be less than his current salary which is €6 million per season and for a period of three years. Buffon is a key player of the club and the team manager Antonio Conte was very happy with this renewal as the team wanted him to stay with club for further period. 0 Respones to "Gianluigi Buffon to renew its deal with Juventus"